When you leave a comment on THIS post by 6 p.m. CT Sunday, May 5, 2013 you'll be entered in the DRAWING for a copy of the book I review below. If you mention in your comment that you’re a follower (see in the left column “Join This Site” and “Follow by Email”), I’ll add your name a second time in the drawing. You must be eighteen, have a U.S. mailing address, void where prohibited. You can read details about my book giveaways and Disclaimers. Ann Shorey is the author of Where Wildflowers Bloom, The Edge of Light, The Promise of Morning, and The Dawn of a Dream. Ann and her husband make their home in southwestern Oregon. but whenever they are together they always seem to do or say the wrong things. When someone threatens Rosemary, will she find the courage to stand, or will she leave town—and Elijah—forever? With tenderness and grace, Ann Shorey invites you back to the town of Noble Springs, Missouri, for an engrossing story of love’s tentative first steps and fragile future in the face of opposition. A nurse during the Civil War, Rosemary settles down in a small Missouri town and seeks employment with Dr. Elijah Stewart. Rosemary gets written threats from people who consider her occupation to be “vulgar,” telling her to leave town. An engrossing story with strong characterization and a beautiful love story. The setting is described so well you’ll think you’re there on the pages with Rosemary. Remember: leave a comment on THIS post by 6 p.m. CT Sunday, May 5, 2013 and you'll be entered in the drawing for a copy of When the Heart Heals by Ann Shorey. You must be eighteen, have a U.S. mailing address, void where prohibited. Please, please remember to leave your email address so that should you be the winner I can get in touch with you for your mailing address. I’ll announce the winner in Monday’s blog. It really does appeal to me, Jo and TY for offering another great read to us! I love reading books that 'take me there'! Hey All, my computer crashed Tuesday!! Just got it back this evening. Sorry I'm late to the party. Sarah, you're welcome. Glad you stopped by and left your comment. Thanks for being a follower of my blog. Good luck in the drawing. I would love to read When the Heart Heals. Thank you for the giveaway. Katie, you're welcome. Thanks for coming by and leaving a comment. Good luck in the drawing. It is hard to imagine that nursing would have been considered vulgar. I would love to read this and I appreciate this chance to read my own copy. I am also a follower and I get your emails, Jo. Connie, it is hard to imagine! I discovered this by accident and knew I had to use it in a novel! Connie, it is hard to imagine when compared to today. Thanks for commenting. I appreciate you being a follower of my blog. Good luck in the drawing. P.S. Connie, thanks for commenting on my Monday character interview blog. My computer crashed this week and I've been out of the loop for a few days. Carolyn, I'm so glad you are a follower of my blog. Thanks for reading it. Good luck in the drawing. Ann Shorey is a wonderful author and I have had my eye on this book for awhile. I love stories about nurses -- have since I was a child! Thank you! I'm a gfc follower and via email. Diana, you're welcome. I appreciate you being a follower of my blog. Good luck in the drawing. I really enjoy Civil War stories. Thanks for having the giveaway. Rose, you're welcome. Thanks for stopping by to read and leave a comment. Good luck in the drawing. P.S. Rose, my computer crashed this week so I've been without a computer for several days. Thanks for commenting on my Monday character blog. I'm a big fan of the civil war era. This book looks like one I'll enjoy. Cindi, thanks for being a subscriber to my blog--I really appreciate it. Good luck in the drawing. I love Civil War stories!! Can't wait to read this one!! Marissa, glad you came by and left your comment. Thanks for reading and being a follower of my blog. Good luck in the drawing. Karen, you're welcome. I appreciate you being a loyal follower of my blog and leaving a comment. Good luck in the drawing. Shelia, yes, it is. They've taken care of me on many occasions. So glad you are a follower of my blog. Thanks for your comment. Good luck in the drawing. P.S. Shelia, My computer crashed earlier in the week and I've been without a computer for several days. Thanks for commenting on my Monday character blog. This sounds like a great book. I'd love to read it. Thank you for the giveaway. Wanda, you're welcome. Thanks for coming by and leaving your comment. Good luck in the drawing. Sounds good, thank you for hosting the giveaway. Wendy, you're welcome. Thanks for reading and leaving your comment. Good luck in the drawing. Hello Jo. Enjoyed your review, and it sounds like a really good story. Hard to believe how some people thought. I've not read anything by Ann Shorey, but would love the chance to win her book. I am a follower of this blog, and commented on your Monday blog..
Maxie, glad you enjoyed the review. My computer crashed earlier in the week and I've been without a computer for several days. Thanks for commenting on my Monday blog! Glad you stopped by and left a comment on this blog. I appreciate you being a follower. Good luck in the drawing. Ann is an author I know. I would not pass up an opportunity to win one of her books. Enjoyed review. I am a follower. Jane, glad you enjoyed the review. I appreciate you being a follower of my blog. Thanks for reading and leaving your comment. Good luck in the drawing. Bonnie, thanks for coming by and leaving your comment. Good luck in the drawing. Pat, you're welcome. Glad you found a new author. Thanks for stopping by and leaving your comment. Good luck in the drawing. I have been wanting to read this story since I first saw it somewhere on Goodreads. I just love the cover image! Jasmine, thanks for reading and leaving your comment. Good luck in the drawing. P.S. I am now a Follower via Email. Love Civil War-ish and nursing stories! Sounds like a great read! Thanks for the giveaway! Stephanie, glad you came by and left your comment. Good luck in the drawing. I enjoy Ann's books and look forward to reading this one. Thanks for the chance to win it! You're welcome. Thanks for reading and leaving your comment. Good luck in the drawing. 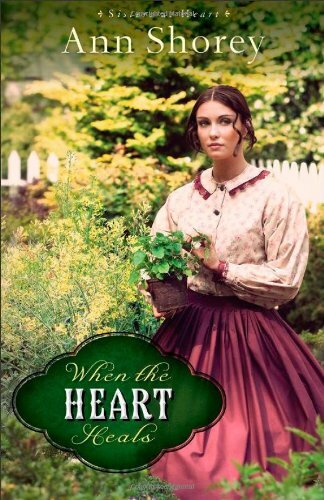 Would love to win a copy of, When the Heart Heals. I read the excerpt above and it really does sound like it will be a good read. I want to find out why Rosemary is threatened and what she does about it! I am a GFC and email follower. Judy, Glad you came by and left your comment. Good luck in the drawing. Sounds like a lovely read, Jo. Thanks for hosting the giveaway - sign me up! Becky, you're welcome and you're entered. Thanks for stopping by and leaving your comment. Good luck in the drawing. Thank you for the chance to win this book. It looks like a nice one to add to my collection. I am also a follower. Angela, you're welcome. Thanks for reading and leaving your comment. I appreciate you being a follower of my blog. Good luck in the drawing.